The Surface Hub – a digital whiteboard meant for conference rooms – was already Microsoft’s coolest hardware you probably couldn’t afford, but its successor takes the concept to a whole ‘nother level. Granted, Microsoft’s Surface promos have been killin’ it for a few years now, but I’ll be darned if I don’t want one of those things for my own home now. I expect Microsoft is going to sell a lot more of these than its predecessor (which only sold to about 5,000 customers, according to Engadget). If you haven’t watched the video, the Hub’s key trick is its ability to rotate 90 degrees, a dynamic form factor in classic Surface fashion. The way the content automatically adjusts to rotation is pretty darn slick. The 50.5-inch panel now features a 4K+ display flanked by tiny bezels. A 3:2 aspect ratio now matches the rest of the Surface line and makes the portrait perspective more useful for certain types of content – imagine a magazine layout or large document. It’s also makes for more immersive video conferencing – it’s neat how the caller on the other end looks pretty much the size of a real person. 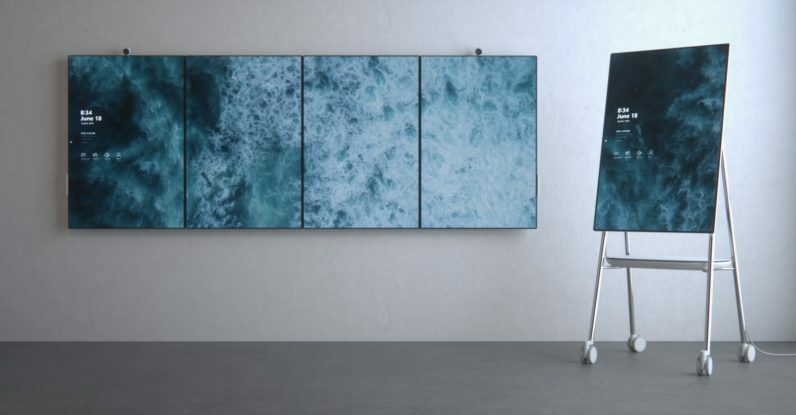 The screen is smaller than on the original Surface Hub – which came in at 55-inch and 80 inch models – but Microsoft makes up for it by being able to tile up to four displays. With the small bezels, it ends up looking pretty seamless, and it means a business can buy however many screens it needs for a given space and budget. Microsoft is also featuring an easle-like stand made by design partner Steelcase, which immediately gives off an interactive vibe you don’t get from most digital whiteboard stands. Of course, it’s a Surface product so it’s compatible with a stylus, while a fingerprint reader and detachable webcam round out the accessories. Granted, this is a promo video and the fact that Microsoft didn’t announce it at Build – or a separate event – suggests the device isn’t quite ready to be shown off publicly. We also don’t know the price yet, but the previous model started at $9,000 (the old 84-inch model cost a whopping $21,899). That seems like a bit much considering many clients will likely want to use the tiling feature; hopefully it’s closer in price to Google’s $5,000 Jamboard.